First thing to know is that Leon Bernardel didn't make violins - he was a dealer and entrepreneur who may have made a couple of violins in his youth. So you should regard this name as a brand used to sell a very diverse array of Mirecourt trade violins - Cousenon took over ownership of this name/brand in 1913. Generally they are OK but they weren't particularly expensive at the time. They seem to fetch a bit of a premium these days just because the name is associated with Gand & Bernardel, Gustave Bernardel, ASP Bernardel etc, but I see no reason why they should cost more than a comparable JTL. This violin is a generic Mirecourt "Amati" model with a heavily rolled edge. It looks quite like violins I have had with a Paul JB Chipot label, but there were about 10 makers in Mirecourt from this family, so could be any of them ... OTOH it's not usual practice for a maker to sign in this place. Ultimately I think you are applying more curiosity to this violin than it deserves. It's a nice Mirecourt trade violin. If the price is right and you like the sound, that's kind of it really! The condition looks very good. Is it a Paul JB Chipot or a very nice Mirecourt in excellent condition with a fake signature? I don't know but it's a beautiful instrument. The signature is not Paul JB Chipot’s. But a Paul JB Chipot is also a Mirecourt trade violin. I'm not a fan of the cheesy edges and fluting. But that's just me. Thanks everyone for your instructive comments. The dealer selling it is asking $12K which I think is WAY too much. But it does have a very pretty, warm sound. Nice wood, front and back, I personally really like French workmanship, red varnish with a yellow ground. For me this would be an excellent trade instrument if it sounds. Leon Bernardel are usually somewhat more expensive than JTL often for no good reason. A proper Bernardel is of course preferable, and in a different price range, but many don't like the style and sound of those (Gand & Bernardel) instruments either. Colorful spirit varnishes are now not so much in fashion. But then so is a Paul Bailly after about 1880 or so, when he followed the Vuillaume business model. Whoever made whatever, whenever is debatable, as is the value etc. This particular generic Mirecourt is a nice example in my opinion, fake signature notwithstanding. I am a fan of French Cheese. Annie, you can find a nice generic Mirecourt for a lot lot less. The Charles Bailly violins were made in such a fashion. Paul Bailly's control was fairly different. We haven’t even seen the signature so how do you know it’s fake? 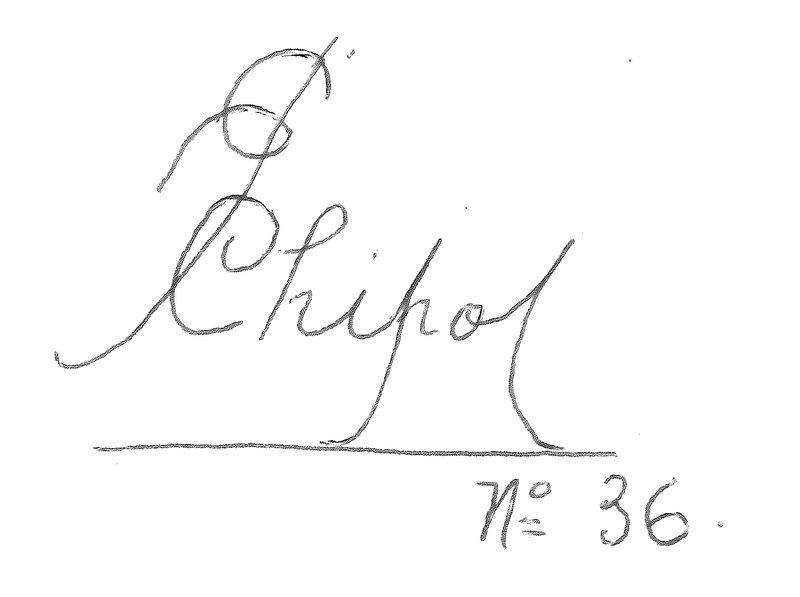 Do you have reference examples of the signatures of all members of the Chipot family? That’s generally how an appraiser verifies a signature. Did Charles Bailly pick the nicest ones he could find from all over France? Is this oil varnish or shellac?
? Not sure of what you're trying to say/ask. I've seen Charles Bailly violins dated as late as the 1940s... and frankly they could have been made by just about any workshop in Mirecourt... A little yellower, and the OPs violin might qualify. This is a spirit varnish, but not just shellac. They used a mix of tree rosins (gum elemi, gum mastic, hum benzoin, venetian turp, ...) mixed with 20-25% of shellac shellac that gives a nice craquel. Most of the 20th centure French makers used spirit varnishes, and the same for many of the Italians (Oddone, Fagnola). If you really want to know, used some alcohol to test, carefully though. An oil varnish will actually polymerise and turn very hard, spirit varnishes can stay very soft. I meant Paul Bailly not Charles. Did Paul Bailly or his scouts pick the best violins from around France to sell in his Paris shop? And was his daughter Jenny an actual maker? I don't think that craquel is intentional, and I don't like it. It's the only part of the violin I don't like the look of. Did they use less shellac and more gum in that technique to give a better sound than with the mostly shellac method? The op's violin is in very good conditon, would that be a tough varnish? I can see it hasn't been played much. The Paul Bailly instruments I've seen (those I would call Paul Bailly instruments) have held together in terms of design workmanship and style... not that he was the lone author, but I suspect if other hands were involved the work was directed by the maker (in a workshop setting). I know a number of colleagues that feel Jenny was a maker... but I've seen so few examples I haven't jumped on board yet. I suppose most of the value is in the label? Putting his signature on an instrument gave it his sign of approval and if we believe the label is genuine it has a certain cachet. I'm interested in learning more about French instruments but there is a lot of mystery. There does seem to be general agreement that J.B. Chipot Vuillaume was no relation to J.B. Vuillaume and that he died long before the violin on this thread was made. I think the valuations are wishful thinking and if I was to buy a nice generic Mirecourt, I could get one on ebay for less than $1000 but maybe not in the same nearly new condition. I also guess they have a more or less generic sound too? To get some craquel they would have used 25-30% shellac. On this fiddle it probably is a mix of craquel and sweat. There does seem to be general agreement that J.B. Chipot Vuillaume was no relation to J.B. Vuillaume and that he died long before the violin on this thread was made. Joseph Charles Chipot married Vuillaume's daughter and double-barrelled his name and put a JB in front of it. At some point this name was bought or acquired by Laberte, at which point it became a trade name/brand name. 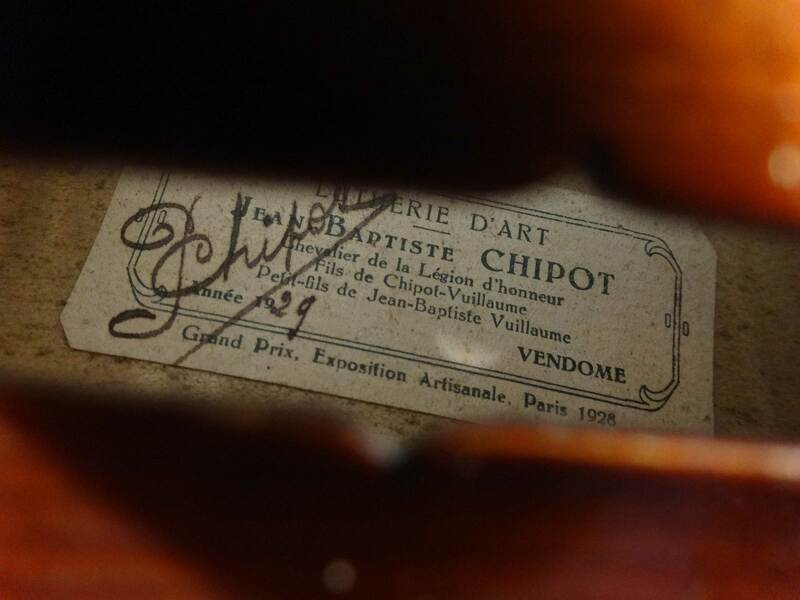 Paul JB Chipot (who we have been discussing here) was his son - he dumped the "Chipot Vuillaume" affectation, though he announced his illustrious lineage on his labels. Paul Bailly - not sure what your point is. 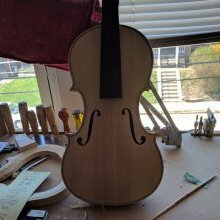 To me Paul Bailly's output is very consistent, and while he may have had helpers like the vast majority of violin-makers, his work is distinctive and of very high quality. If your definition of a proper maker is that s/he works alone and without the help of additional pairs of hands, then we can exclude most makers who have ever lived. With regard to the OP violin, the Leon Bernardel label looks authentic, and the violin is a nice trade Mirecourt violin in which such a label would feel at home. There is as yet no reason to believe that the Chipot signature is genuine - nor have we actually seen a picture of it. But even if it is genuine, the violin is the same with or without it. I have read conflicting stories about the Vuillaume association. I agree the label looks authentic and that the signatures were faked, probably by the in house scribe with the best handwriting. And this may apply to other French violins sold through the up market dealers. I will investigate further on this issue, more out of appreciation than skepticism. I am hower skeptical of Paul Bailly's output. I doubt he made violins from about 1880 onwards, but followed the Vuillaume business model and selected the finest French violins he could find to sell from his shop. Where they were actually made would make for intersting research. Please explain your understanding of the Vuillaume business model. A flat-earther can be sceptical if you tell them the earth is round. Ultimately the validity of a person's scepticism is in direct proportion to their knowledge. I think if you've handled a few dozen Paul Baillys it's clear that they weren't outsourced, although there is a category of violin which we would describe as "Paul Bailly Workshop" which he didn't make or oversee. In this he was no different from pretty much every French maker of the period, Hel, Blanchard, Boulangeot, Collin-Mézin to name but a few. As Jeffrey hints, your understanding of the "Vuillaume business model" seems a bit mistaken - have you read the Millant book? I have read conflicting stories about the Vuillaume association. Joseph Charles Chipot did indeed marry JB Vuillaume's daughter - it just happened to be a different Vuillaume from JB Vuillaume the violin-maker!